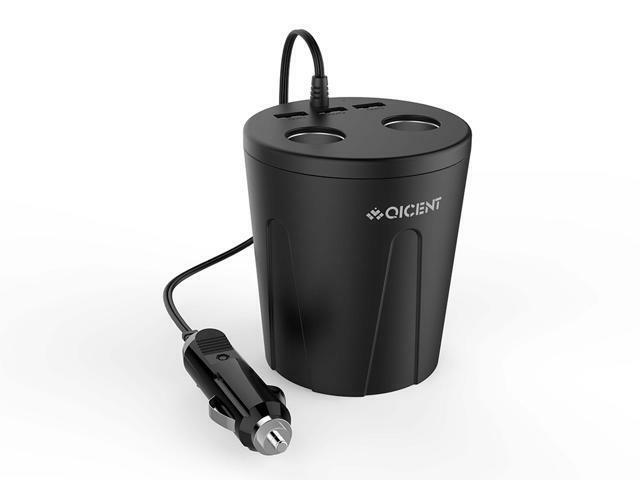 USB Car Cup Charger with 2 Cigarette Lighter Rapid Surper Charger. Detects your device to deliver its fastest possible charge speed up to 2.4 amps or 36Watt. ABS materials, strict quality control testing and multiple protection against surges and short circuits ensure complete safety for you and your device. Multiple circuit protections - over-current, short-circuit and over-temperature protect you device. Left half cup of space convenience for put mobile phones or other device; rubber ring round the cup, good for placed in car cup slot, help to reduce vibration / Built In Smart Charging IC,can automatically detect usb devices current and then provide relative enough current to USB devices so can achieve rapid and safety charging Use your existing USB charging cables to charge most USB powered devices. Easy-to-see LED confirms whether USB charger is properly connected / Sophisticated circuit design with over-heated, over-current, over-charging protection. Charging will be automatically stop when battery is full.